The XF is a refined model and combines sporty driving with a high level of comfort. There is not much room in the back so rear passengers may find it a squeeze unless they are children. The initial limited range has now been expanded and Jaguar offers an efficient diesel engine that is proving popular with companies and private buyers. The Supercharged XFR and the XFR-S are both expensive to run so if fuel economy is important to you these models should be avoided. That said, they give an incredible performance so if speed is your thing, go for it. A compromise could be the 2.2 diesel engine which gives good performance and reasonable fuel economy. The steering that Jaguar has fitted is sporty but satisfyingly strong and the car corners well. The adaptive dampers are an extra but if you have these fitted you will get an even better ride over potholes and bumps. Good suspension and strong brakes make motorway driving very nice. Jaguar has managed to combine a good drive with comfort and the interior of the car has some neat aspects that make this car very special. A touchscreen display with cool blue lighting is just the start. When you turn on the ignition, the gear selector appears from the centre console and at the same time air vents magically shift into place. The eight speed automatic transmission is smooth and comes as standard in all models. Front seats have good support. 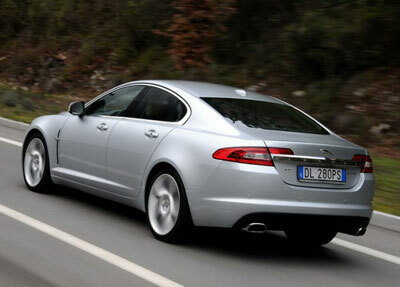 This model has been very impressive with reliability and the XF rose to third place in the Driver Power 2013 survey. Jaguar also came third overall pushing BMW out of the top ten. The car is well built, solid and has a raft of safety measures including stability and traction control. There is also an array of airbags and automatic cruise control. Jaguar has also made a pop up bonnet making it very safe for pedestrians should the worst happen and a collision occurs. The boot has a space saving option and it will hold 500 litres of luggage. This increases to 900 litres with the seats folded down. There are plenty of cubbies and door bins for extra storage. The XF certainly has lots of equipment with Xenon headlights, a leather interior and electric seats being just a few of the items that come as standard. A car as luxurious as the Jaguar XF deserves to be taken care of and you can prevent damage and mess to the boot by investing in a boot mat from our wide range of products. We can supply mats for all XF models. There is a choice of carpet or rubber mats and an order can be easily placed by going to the website and following the simple process. Our custom made mats are made in Britain and we deliver all orders within 6 working days. We also offer a 30 day full money back guarantee in case you change your mind or make an error when placing an order.